Browsing articles tagged with " Joint Stiffness"
Sandy, a 45 year-old woman, complained of bilateral hand and wrist pain on-and-off for many years. Recently for a month now, she felt both hands had constant pain and were tender, warm and swollen. She woke up with morning stiffness that may last for hours and felt firm bumps of tissue under her both forearm accompanied with fatigue, mild fever and gradually weight loss. She visited her PCP and was given naproxen to reduce her inflammation and pain, however, she felt no improvement. 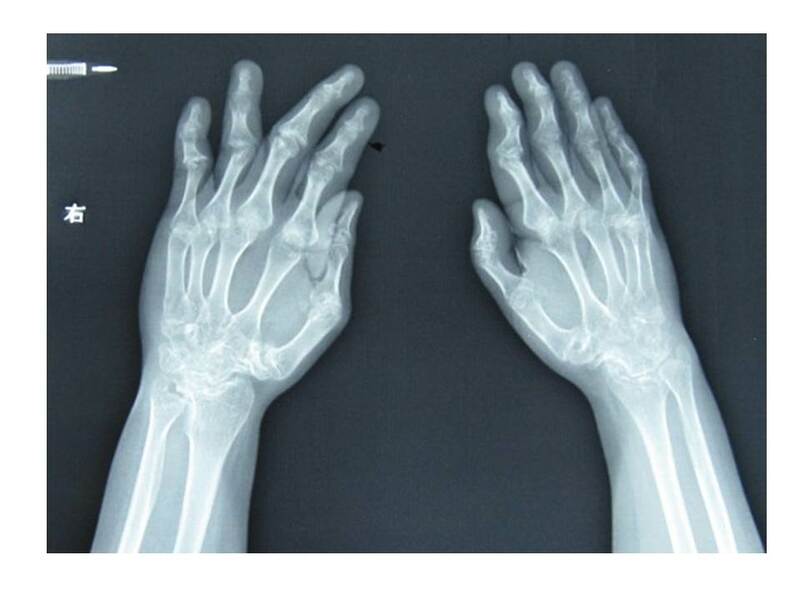 She was referred to a rheumatologist, who ordered x-ray images and rheumatoid factor test. Both were positive for Rheumatoid Arthritis, therefore, the diagnosis was confirmed. The patient was given methotrexate and felt better for morning stiffness and swelling, however, she had many side effects, such as, nausea, vomiting, hair loss, etc. Because of above complaints, she came to me for evaluation and treatment. Rheumatoid Arthritis (RA) is a chronic, long-term disease that causes pain, stiffness, swelling and limited motion and function of many joints. 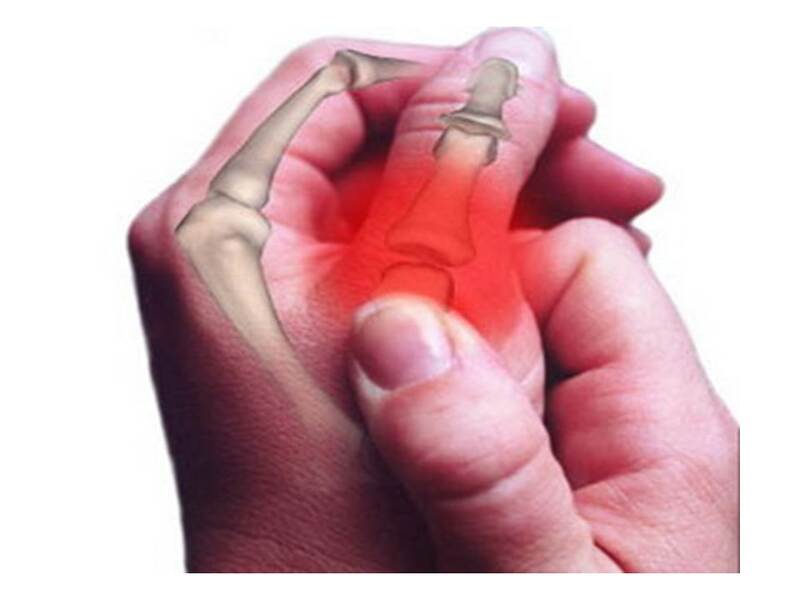 While RA can affect any joint, the small joints in the hands and feet tend to be involved most often. Inflammation sometimes can affect organs as well, for instance, the eyes or lungs. As the disease progresses, symptoms often spread to the knees, ankles, elbows, hips and shoulders. In most cases, symptoms occur in the same joints on both sides of your body. 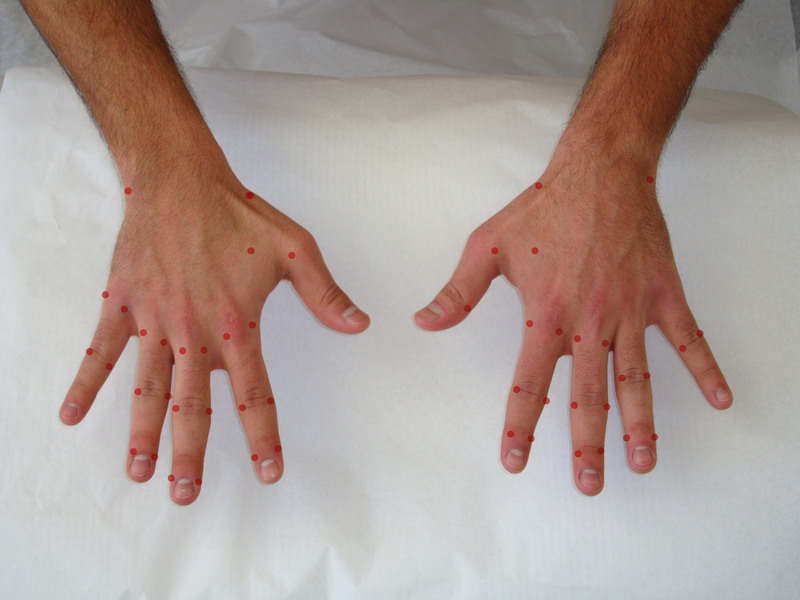 The stiffness seen in active RA is most often worst in the morning. It may last one to two hours (or even the whole day). Stiffness for a long time in the morning is a clue that you may have RA, since few other arthritic diseases behave this way. For instance, osteoarthritis most often does not cause prolonged morning stiffness. The normal joint structure appears on the above left. On the right is the joint with rheumatoid arthritis. 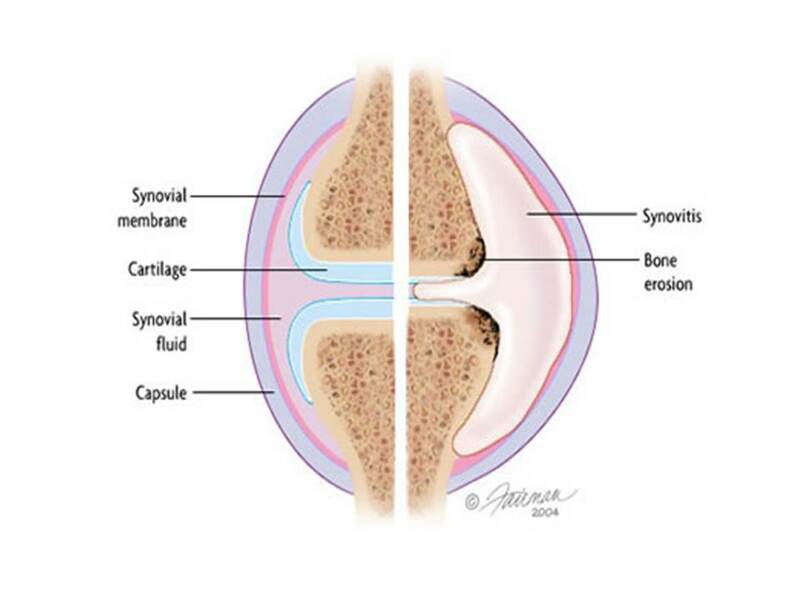 RA causes synovitis, pain and swelling of the synovium (the tissue that lines the joint). 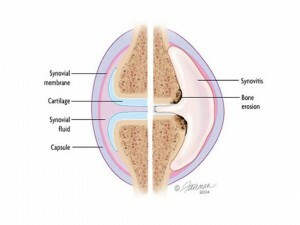 This can make cartilage (the tissue that cushions between joints) and bone erode, or wear away. RA is an autoimmune disease. This means that certain cells of the immune system attack healthy tissues — the joints in RA, cause the inflammation in the synovium, the tissue that lines the joint. Immune cells release inflammation-causing chemicals. These chemicals can damage cartilage (the tissue that cushions between joints) and bone. Rheumatoid arthritis affects the wrist and the small joints of the hand, including the knuckles and the middle joints of the fingers. 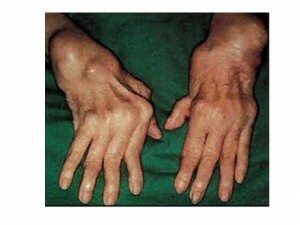 Rheumatoid arthritis signs and symptoms may vary in severity and may even come and go. Periods of increased disease activity, called flares, alternate with periods of relative remission — when the swelling and pain fade or disappear. Over time, rheumatoid arthritis can cause joints to deform and shift out of place. 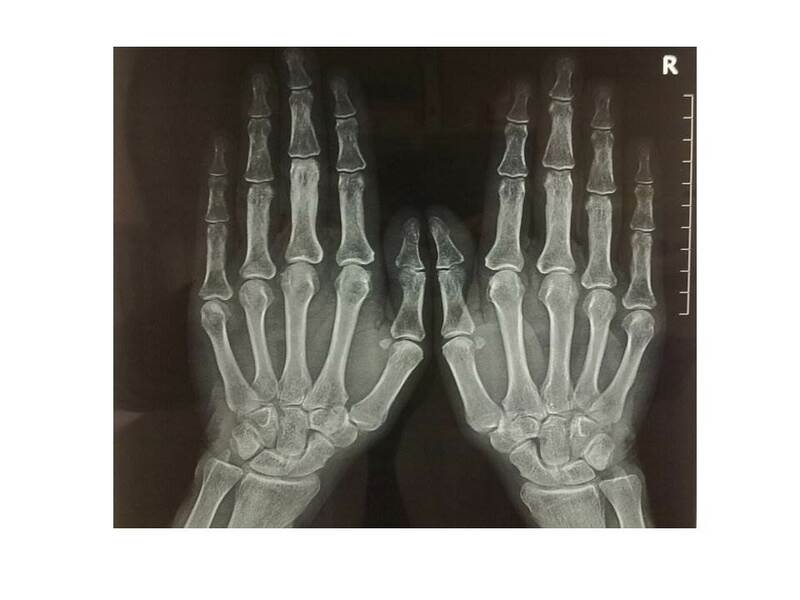 X-rays can help in detecting RA, but may not show anything abnormal in early arthritis. Even so, these first X-rays may be useful later to show if the disease is progressing. Often, MRI and ultrasound scanning are done to help judge the severity of RA. There is no single test that confirms an RA diagnosis for most patients with this disease. (This is above all true for patients who have had symptoms fewer than six months.) Rather, a doctor makes the diagnosis by looking at the symptoms and results from the physical exam, lab tests and X-rays. There is no cure for RA. The goal of treatment is to lessen your symptoms and poor function. No single treatment works for all patients. Many people with RA must change their treatment at least once during their lifetime. The treatment must start as earlier as possible. A goal of physical therapy is to help make the muscles stronger and the improve the motion of the joints. Warming up painful joints is very important in managing pain and priming the body for more exercise. This can be accomplished with moist heating pads, a whirlpool or warm shower. Following the warm-up, aerobic exercise such as a stationary bike, elliptical, or even arm bike will continue to work the body. Other arthritis friendly options are aquatic exercises, tai chi or yoga routines. It is important to be flexible with the workout routine, as if after the warm-up and aerobic exercise the joints are still very sore, change to strengthen a body part with less discomfort. However, do not get in a habit of skipping the warm-up and light aerobic exercise if a joint is tender, as often just these two steps will greatly improve how the joint is feeling. 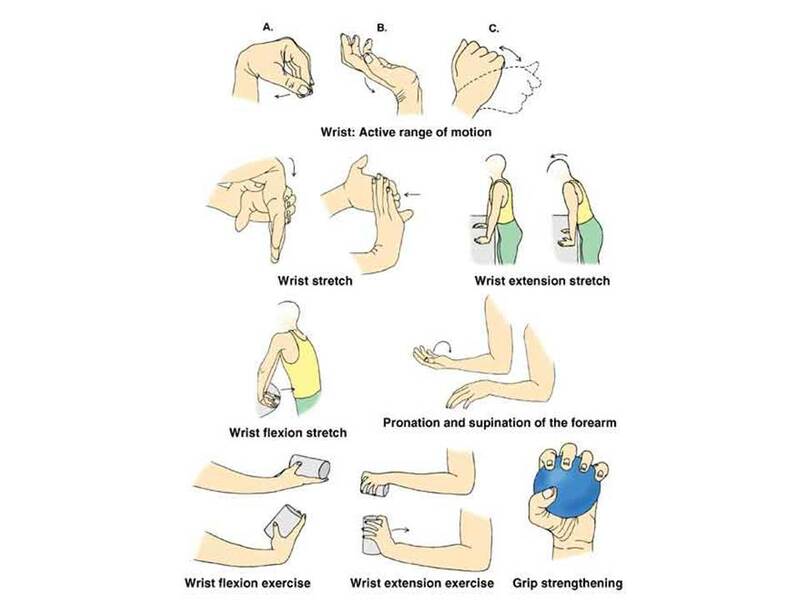 Below are a few range of motion and light strengthening exercises to help the hand that can be performed daily. Good control of RA requires early diagnosis and, at times, aggressive treatment. Thus, patients with a diagnosis of RA should begin their treatment with disease-modifying antirheumatic drugs — referred to as DMARDs. These drugs not only relieve symptoms but also slow progression of the disease. Often, doctors prescribe DMARDs along with nonsteroidal anti-inflammatory drugs or NSAIDs and/or low-dose corticosteroids, to lower swelling, pain and fever. DMARDs have greatly improved the symptoms, function and quality of life for nearly all patients with RA. Common DMARDs include methotrexate (brand names include Rheumatrex® and Folex®), leflunomide (Arava), hydroxychloroquine (Plaquenil) and sulfasalazine (Azulfidine). Older DMARDs include gold, given as a pill — auranofin (Ridaura) — or more often as an injection into a muscle (such as Myochrysine). The antibiotic minocycline (e.g., Minocin, Dynacin and Vectrin) also is a DMARD, as are the immune suppressants azathioprine (Imuran) and cyclosporine (Sandimmune and Neoral). These three drugs and gold are rarely prescribed for RA these days because other drugs work better or have fewer side effects. Patients with more serious disease may need medications called biologic response modifiers or “biologic agents.” They can target the parts of the immune system and the signals that lead to inflammation and joint and tissue damage. These medications are also DMARDs. FDA-approved drugs of this type include abatacept (Orencia), adalimumab (Humira), anakinra (Kineret), certolizumab (Cimzia), etanercept (Enbrel), golimumab (Simponi) infliximab (Remicade), rituximab (Rituxan) and tocilizumab (Actemra). Most often, patients take these drugs with methotrexate, as the mix of medicines is more helpful. The best treatment of RA needs more than medicines alone. Patient education, such as how to cope with RA, also is important. Proper care requires the expertise of a team of providers, including rheumatologists, primary care physicians, physiatrist and physical and occupational therapists. You will need frequent visits through the year with your rheumatologist. These checkups let your doctor track the course of your disease and check for any side effects of your medications. You likely also will need to repeat blood tests and X-rays or ultrasounds from time to time. It is important to be physically active most of the time, but to sometimes scale back activities when the disease flares. In general, rest is helpful when a joint is inflamed, or when you feel tired. At these times, do gentle range-of-motion exercises, such as stretching. This will keep the joint flexible. When you feel better, do low-impact aerobic exercises, such as walking, and exercises to boost muscle strength. This will improve your overall health and reduce pressure on your joints. A physical or occupational therapist can help you find which types of activities are best for you, and at what level or pace you should do them. 1. Common used body points: Du20 Bai Hui, GB8 Shuai Gu, UB9 Yu Zhen, Ht7 Shen Men, GB20 Feng Chi, UB15 Xin Shu, UB20 Pi Shu, UB18 Gan Shu, UB23 Shen Shu, St6 Zu San Li, Sp6 San Yin Jiao, Lv3 Tai Cong, UB2 Zan Zhu, Kid3 Tia Xi. 2. Arthritis: Shoulder: LI 15 Jian Yu, SI 9 Jian Zhen, SJ 14 Jian Liao, SI 10 Nao Shu, SI 11 Tian Zhong, LI 16 Ju Gu Wrist: LI5 Yang Xi and SJ 4 Yang Chi. Hand: L11 Shao Shang, L10 Yu Ji, LI 1 Shang Yang, LI 2 Er Jian, Ht 9 Shao Chong, Ht 8 Shao Fu, SI Shao Ze, SI 2 Qian Gu, SI 3 Hou Xi, SI 4 Wan Gu, PC 9 Zhong Chong, PC 8 Lao Gong. Knee: LI 4 He Gu, LI 11 Qu Chi, St 35 Du Bi, Nei Xi Yan, Sp 10 Xue Hai, St 34 Liang Qiu, He Ding, UB 40 Wei Zhong. Feet: St 45 Li Dui, St 44 Neiting, Sp 1 Yin Bai, Sp 2 Da Du Sp3 Tai Bai, Sp 4 Gong SunUB 66 Zu Tong Gu, UB 65 Zhi Yin, UB 65 Shu Gu. 3. Neurological Symptoms: Fatigue, Depression and Poor Sleep: Major points: St 36 Zu San Li, PC6 Nei Guan, LI4 He Gu, Ht7 Shen Meng, Sp6 San Yin Jiao, GB20 Feng Chi, Du20 Bai Hui, EX-HN1 Si Shen Cong, assistant points: Du14 Da zhui, Ren12 Zhong Wan, Ren14 Ju Que, Ren6 Qi Hai, Ren4 Guang Yuan, UB21 Wei Shu and UB23 Shen Shu. 5. Dizziness: Si Shen Chong, Du20 Bai Hui, Du12 Shen Zhu, UB12 Feng Men, UB43 Gao Huang, Sp6 San Yin Jiao, St36 Zhu San Li, LI11 Qu Chi. Sandy was treated with me for 2 x per week for 8 weeks. I first try to decrease her pain at the joints and body with the points of group 1 and 2 , then, I used the group 3 and 4 points to help her to improve her fatigue and depression, after about 2 month’s treatment, Sandy was put on maintenance treatment program once a week for 4 weeks, and she felt much improved. Her pain scale decreased from 7/10 to 2/10. Her swelling at both hands is much relieved. 1. Multiple Therapies are the best way to treat RA with combination of medicine, PT and Acupuncture. 2. Newer treatments are effective. RA drugs have greatly improved outcomes for patients. For most people with RA, early treatment can control joint pain and swelling, and lessen joint damage. 3. Seek an expert in arthritis: a rheumatologist. Expertise is vital to make an early diagnosis of RA and to rule out diseases that mimic RA, thus avoiding unneeded tests and treatments. A physiatrist who is an expert in RA also can design a customized treatment plan that is best suited for you. Therefore, the rheumatologist, working with the primary care physician and other health care providers, should supervise the treatment of the patient with RA. 4. Start treatment early. Studies show that people who receive early treatment for RA feel better sooner and more often, and are more likely to lead an active life. They also are less likely to have the type of joint damage that leads to joint replacement. 1. Treat your patients as a whole person and long-term treatment is necessary. You should encourage your patient perform exercise, which will keep your patients’ mobility of hands and other joints. 2. Encourage your patients to have at least 8 weeks treatment. It is very important to have a long-term treatment to achieve the best results.